Newark, New Jersey's most populous city, has many profound problems, including poverty, crime, decaying infrastructure and a history of political corruption. It has a great subway, though. 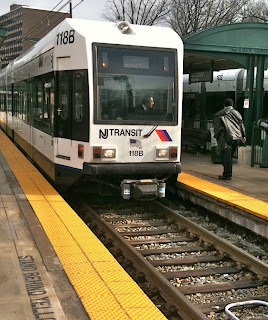 The Newark City Subway is safe, clean, runs on time, and was recently extended. Perhaps most surprising is the ticketing system. You buy your ticket at a machine, get it stamped, and you get on the train (it's technically a light-rail system, but everyone calls it by its old name.) Theoretically, someone might ask to see your ticket (and give you a $74 fine if you don't have one), but I've never seen one of these ticket inspectors. It's basically an honor system. That's right, 8 miles west of New York City, the turnstile-jumping and publishing capital of the entire known universe, there exists a subway system where the practice of turnstile jumping is nonexistent because there are no turnstiles. As publishers transition their business models from print to digital, they are faced with the incredibly hard task of establishing new economic models and social practices. It's more than a matter of legal agreements, copyright laws, and digital right management software, it's establishing a social contract around a new technology. To establish that contract, they need to obtain assent from readers, authors, and society itself. That's one reason libraries could be very valuable to ebook publishers. Over the years, libraries have built social capital far in excess of their economic impact and they have a unique ability to shape readers' expectations for how ebooks could work. Even so, I was surprised to learn that this week, at the Public Library Association Meeting in Portland Oregon, Overdrive, Inc. is announcing a program which will allow libraries to lend DRM-free ebooks. Overdrive is the leading provider of ebooks to public libraries in the US, with over 10,000 libraries in its network. I had thought that libraries couldn't possibly lend ebooks that weren't wrapped in some sort of digital rights management system. The concept of "lending" DRM-free ebooks just didn't make a lot of sense to me. So I talked to David Burleigh and Angela James about the program. Burleigh is Overdrive's Director of Marketing, and James is Executive Editor at Carina Press, a digital-first division of Harlequin Enterprises Ltd. that's just starting operations. Carina is one of three publishers whose participation in the DRM-free program has been announced. (The others are Saddleback Educational Publishing, and Rourke Publishing). Overdrive is already providing 30-40% of its audiobooks to libraries without DRM. (This makes them much easier to load onto an iPod!) These are handled within the Overdrive Media Center pretty much the same way audiobooks with DRM are handled; although all the details are yet to be determined, the DRM-free ebooks will likely be handled using procedures similar to those used for DRM-free audiobooks. Carina, which expects to launch this summer, will be selling DRM-free ebooks through its own website and "the usual suspect" distribution partners, according to James. Since they plan to be DRM-free in their direct-to-consumer channel, the lack of DRM in the Overdrive library program is not such a huge step for them. While consumer pricing for Carina ebooks will be $2.99 to $6.99, the pricing for libraries hasn't been decided yet. The purchase and usage model for DRM-free ebooks, at least to start, will be almost the same as for DRM ebooks. The library will be able to purchase one or more licenses for use by a single user of the book at a time. In other words, the patron will be able to borrow the ebook for a set borrowing period, during which time other patrons will not be able to read the ebook. At the end of the borrowing period, the patron will be reminded to delete the book from their computer or reading device. With DRM, the ebook "self-destructs" on its own, which might be viewed as a convenience if not for the headaches DRM can impose on users. Without DRM, the patron is on the honor system. Yes, you read that correctly. The ebook borrowing will use the honor system. Many other details, such as library licensing terms, are as yet unclear. I will be interested to see whether the downloaded ebook files contain serial numbers or watermarks that could be used to monitor files that escape from the library lending environment. I also wonder whether ebook lending will be tied to ecommerce opportunities- if the patron hasn't finished the book by the end of the lending period, they should be offered a chance to purchase the book, I would think. According to James, much that Carina is doing is being done with the consideration that readers will purchase books. They might borrow an ebook from the library and then buy the rest of the series to read on the airplane. As I tried to imagine how honor-system ebook lending might work in practice, I began to think about the many opportunities that libraries and librarians have to engage patrons and set expectations on their behavior. That could be very poowerful. It takes me a fraction of a second to dismiss a dialog box informing me of terms and conditions that I have no intention of paying any mind to. But if a librarian looks me in the eye and entrusts me with a valuable manuscript, you can bet I'll defend it with my life. 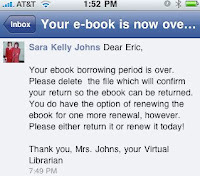 Imagine getting a Facebook message from your smiling librarian letting you know that it's time to delete your borrowed ebook. Damn right you'll delete it! Honor system ebook borrowing could even evolve into a reimagining of DRM. Instead of digital RiGHTS management (DRiM), it would be digital ReSPONSIBILITY management (DReM). A user could commit to deleting an ebook after a while, and DReM software could assist the user in executing and documenting the deletion. It seems that whenever a DRiM discussion arises, it devolves into pronouncements about the evils of DRiM, the mortal threat of piracy and conflicting lessons from the napsterization and itunesification of the record industry. In the absence of a generally accepted social contract surrounding ebooks, it's no wonder that user compliance is in doubt. By contrast, the honor system for library borrowing is crazy enough that it might actually work, and both libraries and publishers ought to support this program to see if it does work. Like the Newark City Subway. Sorry, I've been a librarian over nearly 40 years - it won't work. When using non-fining or low-fining loan services, library borrowers are "on their honor" to return their borrowed items when they are due. At the libraries where I have worked, around 50% don't. A technology (such as automatic deletion) which doesn't allow the possibility of non-compliance is elegant and efficient. I have to hold out a little more hope than this, Verna, if nothing more than the fact that the personal touch seems to have something of an influence. We've been offering automated account notices via text message over the past year. It's still a growing population that has signed up, but it's certainly beginning to find a niche. What's more interesting is that we haven't had to send out an overdue notice to any of these users since November. I still don't want to get ahead of myself, but this added touch seems to be having an effect. Will people fail to delete their DRM-free audiobooks? Of course they will. Will more people check out materials from a system that doesn't assume that they're up to something shady? I'm guessing yes. I'm no fan of the hassles of DRM, but this cannot work. With a physical book or a DRM ebook, at least the library knows you've "returned" the item (either by selecting "return borrowed item" from Digital Editions or from dropping the physical book into the slot. DRM-free lending means there can be no accountability. The user will be informed that he or she is required to delete the file as per the licensing agreement and that's it. The consumer has been informed, the library is free to lend the book to someone else, and that's that. It's as if a magical duplicate book was in the drop slot and the reader may never returned the book at all.